Baedeker arrived too early to appreciate one of the great pleasures of Bussaco, which is the wine produced by the Bussaco Palace Hotel. The first bottles date back to 1917. The Palace Hotel owns no vineyards, it buys its grapes from the Bairrada and Dão region. The quality of the wine comes from the careful grape selection and the meticulous traditional methods used in production. Bussaco wines taste great when they are young and taste even better when they lived for some decades. Both whites and reds are famous for their longevity. These wines are difficult to buy, the easiest way to try them is to stay at the magnificent Palace Hotel. The cellar of the palace stores thousands of bottles going back to the 1920s. Trying these old Bussacos can be a mystical experience. The cellar walls are used to hearing visitors say words like divine, blessed, and sacred. These words would have delighted Friar João Batista, the Carmelite monk who started making wine in Bussaco in the 17th century. 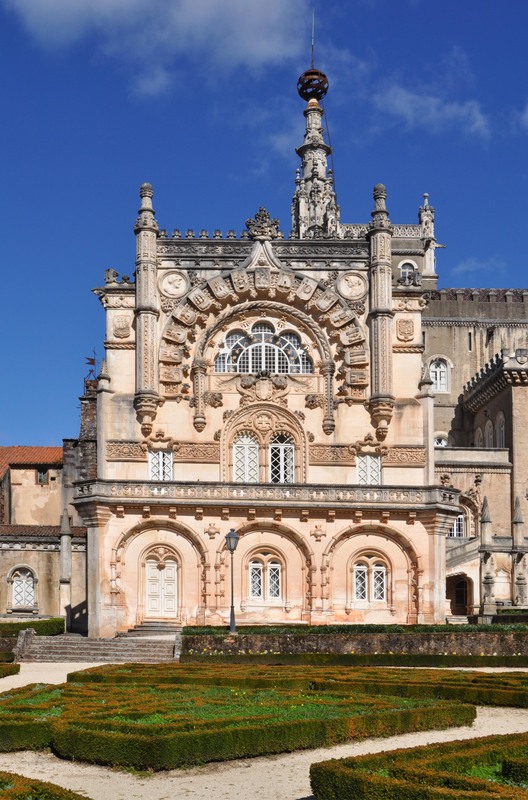 Click here, for the Bussaco Palace web site. Agatha Christie, the murder-mystery writer, was married to an archeologist (she joked that “an archeologist is the best husband any woman can have; the older she gets the more interested he is in her”). Her husband wanted to visit the Roman ruins at Conimbriga, so the couple spent some time in Portugal. They chose the Bussaco Palace Hotel as their base and stayed in room number 7. The romantic surroundings must have appealed to the mystery writer. But the only crime committed in this luxury hotel was the occasional spilling of a few drops of precious Bussaco wine. And there was no need to call Hercule Poirot because it was obvious that the butler did it. When we eat lunch at the Palace Hotel in Bussaco, we feel like a character in a 19th century novel. There is a serenity, an ability to enjoy the passage of time that is absent from modern life. The items on the menu are variations on traditional recipes, prepared with care and served with elegance. 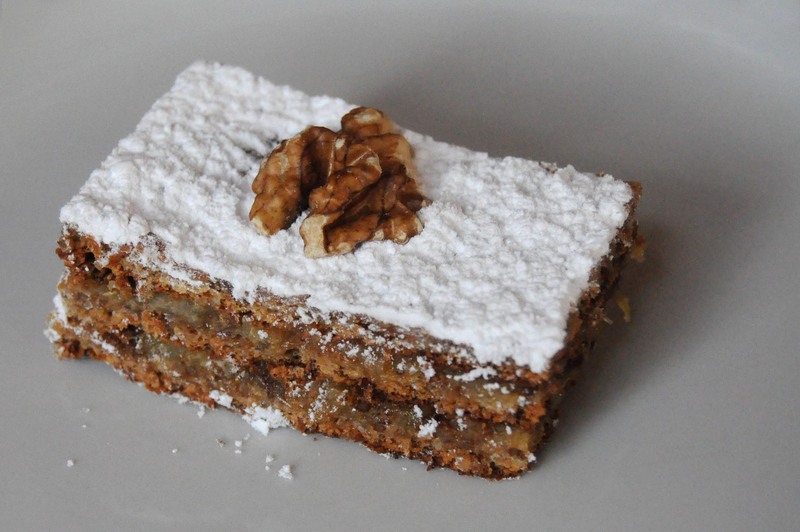 When the dessert cart arrives, the waitress recommends without hesitation the “Morgadinho do Bussaco.” It is a perfect dessert, made with only nuts and honey. Morgadinho means young heir. We’re lucky that Bussaco inherited this old recipe and shared it with us. 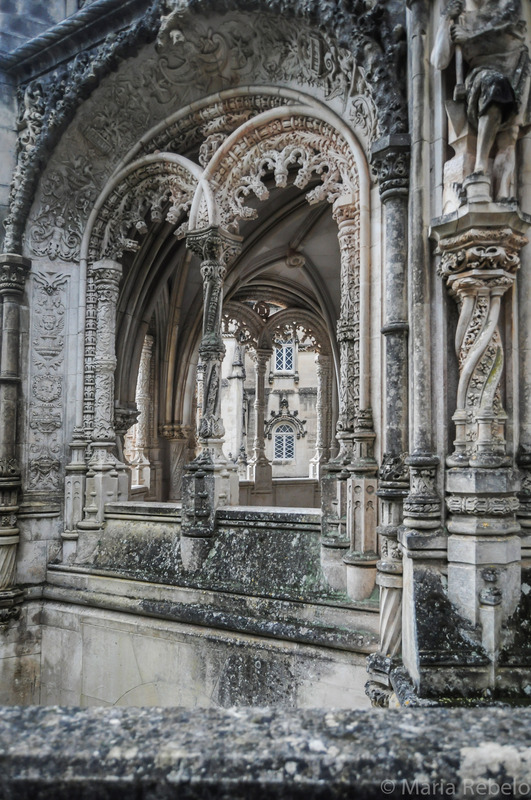 Bussaco is one of the most romantic places in Portugal. It was once a Carmelite monastery where only men were allowed. When, in the 17th century, Queen Catherine of Bragança announced a visit, the monks opened a special door for her. But the visit was canceled and the door was immured. The monks called the lush woods around the monastery “boscum sacrum,” sacred woods. Some say this designation is the origin of the word Bussaco. It was in these woods that Portuguese and English troops led by the Duke of Wellington defeated Napoleon’s army. By the late 19th century, the Bussaco monastery was in ruins. King Dom Carlos transformed it into a pavilion where the royal family could stay while hunting for wild boars. Later, the pavilion was converted into a fairy-tale luxury hotel that became a favorite with the European aristocracy. Dom Manuel II, the last king of Portugal, came here on vacation, not knowing that he would soon be forced into exile. The Carmelite monks used to produce wine in the monastery grounds. The Palace Hotel revived this tradition in the early 20th century, making unfiltered wines with grapes from two regions, Dão and Bairrada. You cannot buy these legendary wines anywhere, so you have to travel to Bussaco to try them. It is a trip you’ll not forget.